This is a continuation of our series on “training outside the box.” We have reviewed important steps to prepare for training on the trail. In the last article you learned to recognize if a horse has inner energy and playfulness and how to release it through forced exercise like longeing. Now that the horse is ready, before going out on the trail there is one more important step. It is getting you, the rider, ready for riding. Like any physical activity, it is important that the rider prepares his or her body by stretching and loosening up the muscles and joints to be used. I am going to give you stretches for the upper and lower body. These head-to-toe exercises are easy and fun to do. Make it a habit to do them before each ride. Stretching should start with the rider standing on the ground next to the horse that is tacked up and ready to ride. Not only will these stretches help the rider limber up, they have the added benefit of teaching the horse to patiently stand still while the rider is doing them. 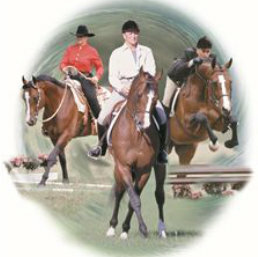 Standing and waiting for the rider to complete the exercises keeps the horse thinking “slow.” When these stretches are completed, the rider can mount and continue with under saddle stretches. As with all physical activities, if you experience any pain or have medical conditions that could be complicated by doing any of these exercises, STOP! Seek advice from a health care professional before continuing. All of these stretching exercises should be done very slowly. Do several repetitions before moving on to the next exercise. Be sure to breathe when doing them. This is important because it encourages relaxation. If you find yourself holding your breath, try talking or singing to encourage regular breathing. The purpose of this exercise is to stretch neck and shoulder muscles. Stand evenly on both feet with arms straight down at your sides. Looking straight ahead, inhale and very slowly lift your chin up as far as possible. Hold this position for a few seconds, exhale, and very slowly lower your chin to the chest. Hold for a few seconds and return to straight ahead position. Keep the shoulders down and relaxed. Continue these stretches until your neck and shoulders feel relaxed. Like the first stretch, this exercise helps relax the shoulder and neck muscles. The key to making this exercise effective is to only move the head. Lower the chin to the chest, then slowly rotate the head with chin down toward the left shoulder, then the right. I like to close my eyes when doing this exercise because it helps me relax and move slowly. 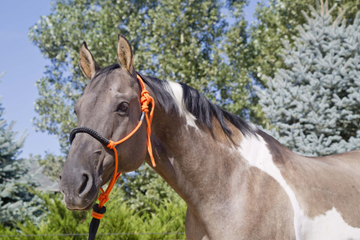 With the reins in either or both hands, inhale and bring both shoulders straight up as if trying to touch the earlobes. Hold for a few seconds, then exhale and relax the shoulders down. Do several repetitions. This exercise is good for loosening up the shoulder and upper back muscles. Extend the right arm in front of you with palm down and fingers pointed. Keeping your eyes on the hand, rotate the arm in a full 360-degree arc: up overhead, behind you, down alongside your leg, then back to the starting position. Always keep the palm facing towards the ground. The challenge with this exercise is to maintain proper lower body position and not twist your body as the arm is rotated. Do several repetitions, then repeat with the left arm. Extend both arms in front of you and parallel to the ground. Keep your chin level throughout the exercise. Breathe in as you bring both arms up slowly. Lift the arms until they are next to your ears and fully extended upward. Hold this stretch. Bring the arms down slowly as you exhale slowly. After the arms are down, end with pushing the shoulders down. The exercise works the pelvic area and the muscles in front of the thigh called the quadriceps. Stand on the horse’s left side and with the right hand holding on to the side of the saddle to keep your body centered during this exercise. Working one leg at a time, slowly swing the entire leg forward as far as possible, then extend it backward. Keep the knee slightly bent. To be effective, the movement must come from the hip joint, not from swinging the lower leg from the knee. Keep the upper body as centered and still as possible. Do several swings with one leg. Turn so you are facing to the rear and hold the saddle with the left hand. Repeat the exercise, slowly swinging the opposite leg. The horse should stand still for this exercise. If he does not, position him with a stationary object like a fence or a trailer on one side. This will help him stay straighter and stand still. If he does not, he may be telling you that he has inner energy to release through forced exercise like longeing. This exercise limbers up the inner thigh muscles and flexes the hip. Standing on the horse’s left side while holding on to the saddle with the right hand for stability. Stand on the right leg and slowly lift the left leg out to the side. Keep the knee straight. Slowly lower the leg. Maintain a straight posture and avoid leaning while lifting the leg. Do several repetitions. Turn and repeat on the opposite leg. Here’s the equestrian version of a classic stretch that limbers the calf muscles. Stand facing the horse’s left side with both feet together. Put both hands on the saddle or the withers for support. Step back with the right leg and extend it behind you. Keep the right knee very slightly bent and the right foot flat on the ground. Bend the left knee and lean forward slightly. You should feel a nice stretch in the back of the calf. For more stretch, bring the hips forward. Hold this stretch, but do not bounce or force it! If the horse moves away from you, you are pushing on the saddle too much and not stretching enough. This exercise increases ankle flexibility while improving balance. Stand on the horse’s left side facing forward. With knee bent, bring the left leg up and hold it with the left hand beneath the knee. Rotate the left ankle in a circular motion inward toward the horse. Repeat, rotating outwards. Do several sets of rotations. Turn and repeat with the opposite ankle. As you are doing these exercises and preparing yourself to be a good rider for your horse, you have a great opportunity to train your horse to be patient, mannered, and obedient. He will learn that he goes on your command and not the other way around! This is an important lesson. It is the next step in teaching him to stand still while mounting. Let’s mount up and do some stretching and flexibility exercises under saddle! The next set of exercises is an extension of those done on the ground. Mount your horse and ask him to stand still. Practice these head to toe stretching and flexibility exercises under saddle, before each ride. Perform this stretch the same was as it was done on the ground. Stay centered in the saddle, sitting square, and evenly balanced. This exercise improves the flexibility of the shoulder joint. With the reins in your left hand, place the fingertips of your right hand on top of your right shoulder keeping your elbow at shoulder height. Slowly rotate your shoulder in a 360-degree arc from front to back and vice versa. Imaging drawing a circle (in the air) with your elbow! Do several slow circles. Repeat with the other arm. This exercise stretches the hands, joints of elbows, and shoulder. Make a fist with one hand. Punch the hand slowly out in front of you. As you fully extend your arm, open the fingers and stretch out the hand. Repeat punches forward, up overhead, to the side, and down at your side. This exercise helps stretch the rider’s back. Keeping the legs in proper position, stretch forward from the hips and touch the horse’s ears. If you cannot stretch this far, reach as far forward as possible toward his ears. If riding in a Western saddle, stretch forward with one arm at a time, putting the other hand on the horn. If riding in an English saddle, stretch both arms forward. Be careful that your legs do not swing back when stretching forward. Doing this puts you out of proper position and will not give you the full benefit of the stretches. Here’s a fun exercise to stretch the upper and lower back and abdominal muscles. Keeping the legs in proper position, hold the reins with the right hand. Rotate the upper body to the left and reach the left hand back toward the top of the horse’s tail. Hold on to the saddle with the hand holding the reins if needed. It may some like something a contortionist would do, but this challenging exercise helps develop leg and inner thigh muscles as well as balance. Start with legs in normal riding position and feet out of the stirrups. With the knee slightly bent, bring the right leg above the neck with the foot extended toward the horse’s head. Then bend the knee and extend the lower leg and foot across the horse’s neck and down toward his left shoulder as you grasp the cantle with your left hand for stability. The leg should be held up and above the horse’s neck and shoulder by several inches. Bring the leg back over the horse’s neck and return it to normal riding position. Alternate with the opposite leg. The goal with this exercise is not to touch the horse’s neck. If he is not used to this type of movement from you or reacts, just lift your leg to the middle of his neck and scratch his neck with your toe. With both hands behind you, grasp the cantle keeping the elbows slightly bent. Bring the upper body back slightly as you lift both knees up at the same time. Touch the knees together over the horse’s withers or the saddle horn and slowly bring them back to the starting position. Slightly rocking the upper body back as you do this exercise makes the hip joint more flexible. Be careful not to kick your horse! This is a challenging exercise that also builds leg and abdominal muscle strength. If you can only bring the knees up part way, it’s OK. Keep practicing a little at a time until you can touch them together. This exercise is done the same way as was done on the ground. It really works the inner muscles and hip area. Take both feet out of the stirrups. Lift and extend one leg out to the side, while keeping the other down in proper riding position. Do several lifts on each side. You should notice a feeling of sitting deeper in the saddle after completing them. This is a great exercise for stretching the quadriceps, the large front thigh muscle, and improving ankle flexibility. Let’s start with the right leg. Taking the right foot out of the stirrup, flex the knee and bring the foot up and behind you to the back of the saddle’s cantle. Grasp the back of the ankle with your right hand as you keep the foot flexed. Hold this stretch for 5-10 seconds and breathe! Keep the knee on the saddle and stretch the upper leg down. Then release the ankle and allow the lower leg to stretch back down toward the stirrup. Repeat with the other leg. With feet out of the stirrups, flex one ankle so the toes point upward. Hold for a few seconds. Then flex the ankle so the toes point toward the ground. Do five toe points on each foot. These head-to-toe exercises on-the-ground and under saddle will give you the minimal stretching needed before each ride. 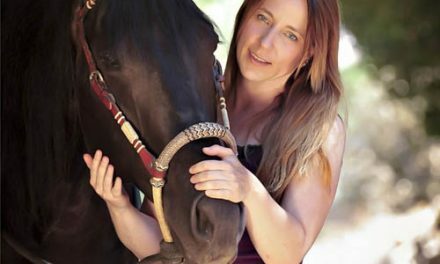 To really improve flexibility, strengthen muscles and joints, and relax, I would recommend my 3-part “Exercises for Equestrians” videotape series. The tapes cover 75 different exercises that can be done on the ground or under saddle. They will take you to the next step in being the rider your horse deserves. PreviousConfidence In The Saddle . . . How’s Yours?